Coming from a University of Applied Science it has been a real challenge to me. being a number in a rather big classroom with no personal interaction from the lecturer refers to a concept which I appreciated to have gotten to know, but I still prefer the idea of communication within classes. This is not much a difference between two countries, I know. But I was aiming at showing the differences. Despite being a highly accredited university within the region, Ülikool Tartu lacks efficiency and clear focus. Maybe that may be different for my perspective of being an ERASMUS student, but I am shocked regarding the lack of clarity among certain factors. Teachers missing without notifications, teachers answering private calls during class, no predefined schedule, no ideas regarding the assessment. I have spent hours discrediting the Hanze for its unclear structures and its complicated means of communication, but now I gained awareness that maybe this is no Dutch or an Estonian issue, but one that spreads across higher education institutions. 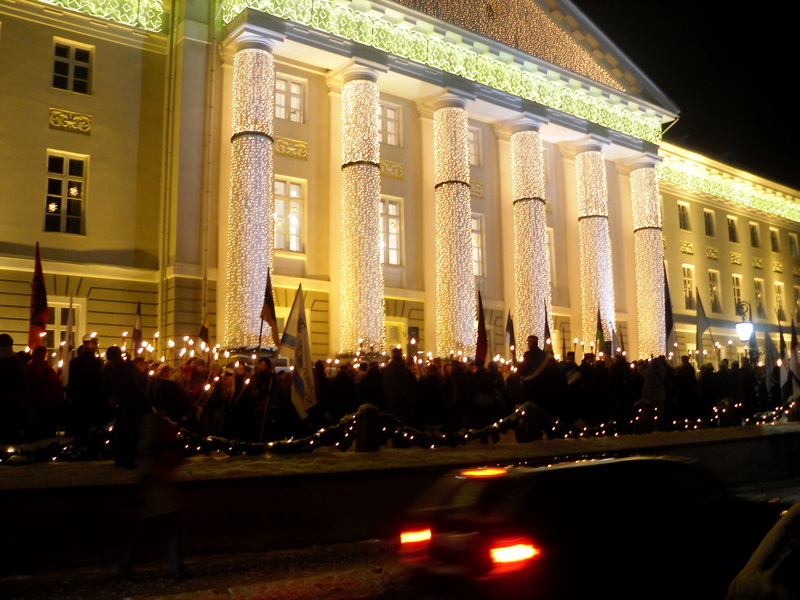 The image below shows a procession of Estonian societies during a torch walk from the Vanemuine Theatre towards the University’s main building. I have seen snow and cold weather in my life. Yet I have barely even been exposed to -19°C and heavy wind at 9pm at night. It is slippery, my beard keeps freezing, snowball fights with Americans seem like modern warfare and sledding down one of the highest hills within the country – all that is what, all that is what makes a winter in Tartu being much more interesting than a winter in Germany or the Netherlands. Of course, I really miss the Christmas markets in Oldenburg or watching the arrival of Sinter Klaas in Groningen, or the winter festival nearby the waterside in Groningen, but for 1 winter, these new impressions are highly valuable to me! I admit, German and Dutch are not among the most beautiful languages in the world, no doubts about that. But let it be due to linguistic history, roots of people or general an ability to speak to a crowd of people, but the language of Estonian is not mad for public speaking. The language is not as “lively” as Spanish or Italian, but also – rather stiff – languages like Russian or Norwegian sound more cheerful and thus more entertaining than Estonian. I witnessed a speech by the dean of the university the other day and even though I give some room for interpretation (in addition to zero understanding of the language itself), it was very difficult to follow, since I could not reckon a rhythm in the speech. One needs to know that the language per se is not well elaborated, in terms of number of words. Rather, the end of main words is being changed according to the meaning of the word or its usage. So sentences sound long while in fact very little words have been used and only changes have been made to the endings. Therefore, the rhythm is not a present as I am used to be hearing and thus, it does not sound sweet! a. They do have them here in Estonia (though “only” in Tallinn and Tartu), and they are clearly related to their German heritage (I will not go too much into detail here regarding the history, but my people have been the ruling elite in the region for several centuries). A big tree, highly illuminated (and thus disobeying the Kyoto protocol) with cards to Santa, written by kids stands in the middle of the Raekoja plats, leaving only limited space for the boat. The boat? Yeah, the boat! For a second successive year, a big wooden ship has been transported to Tartu, offering people to enter it, hold seminars and workshops on it, chop wood for the open fire, drinking hot spiced wine (Höögvein in Estonian) or Solyanka (Russian-style meat soup). The fountain, which has been covered in previous blogs is frozen (so is the river! ), but with temperatures around -19°C at night that is no surprise. 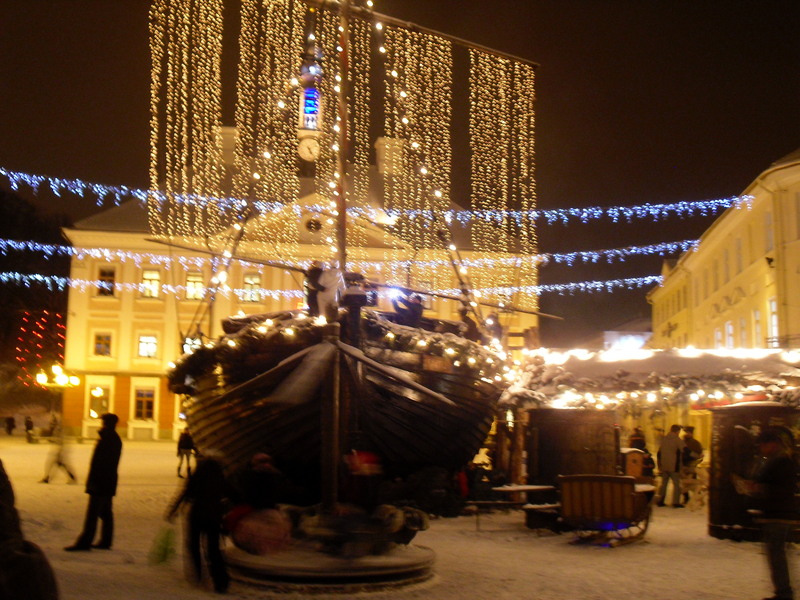 Now before I post this blog, I will publish a link about the boat in Tartu. I don’t want to mention too much right now, but you got to give it a glance, you might find someone you know…! 118 days in Tartu, times have passed so fast; it seems just as yesterday that I left the base. Only some weeks are left, but I am sure I will make the most out of it and the end of my ERASMUS will witness a sort of payback….So stay tuned! This entry was posted on Wednesday, December 8th, 2010 at 15:50	and tagged with beer, ERASMUS, Estonia, People, Tartu and posted in Christmas Market, ERASMUS, Estonia, Tallinn, Tartu, Vanemuine. You can follow any responses to this entry through the RSS 2.0 feed. I love reading your observations.